How to See Comet ISON This Week! The time has finally come to step out under the stars and see the latest comet the outer solar system has thrown at us. Comet ISON (C/2012 S1), discovered more than a year ago, has engendered huge interest from those who think it may be terrifically bright and also from some who believe it will be nothing special. The burst of excitement came from the realization that ISON will swoop quite close to the Sun on November 28, some 1.8 million kilometers from our star's surface, which will enable it to light up like a Roman Candle. The next few weeks will undoubtedly give us our best shot at ISON. To see it this week, you'll need to venture out in the early morning, around 4 a.m. local time, and look toward the constellation Leo. You won't see the comet quite yet with the eye alone -- it's still climbing in brightness -- but a pair of binoculars or a small telescope will show it under a dark sky, away from the polluting light of cities. The circumstances are good as the comet continues to brighten. Around 4 a.m., head outside and look to the east to see Leo rising -- a simple star map like that in Astronomy magazine will help you spot the constellation, which looks like a question mark or sickle, along with a bright triangle of stars closer to the horizon. This week the comet is inching along to the east, underneath Leo's bright triangle of stars. It's currently near the border of the constellations Leo and Virgo. Regulus is the brightest star in the sickle of Leo, and the bright ruddy "star" southeast of it is actually the planet Mars. The brightest star in the triangle of Leo is Denebola, and that's where you'll start to find the comet. For the next week and a half, the comet will be lazing eastward between the stars Sigma in Leo and Eta in Virgo, and the accompanying map will show its path relative to those stars. Don't expect ISON to knock your socks off just yet. As mentioned, a dark sky is important, and that includes as little interference from moonlight as possible. The Moon now rises after 4 a.m. and is just a slender crescent, so it won't detract much for a while. But the comet is currently glowing at around magnitude 9, which means it's still too faint to see with the eye alone. It will appear as a soft glow, a fuzzball shimmering from the gases released from the comet's frozen nucleus, which measures a few kilometers across, as it increasingly warms in sunlight. The comet's so-called coma, the fuzzy blob you'll see in binoculars or a telescope, spans about 5 arcminutes across. That's one-sixth of the diameter of the Moon. A faint tail drifts away some 0.3°, more than a third of the Moon's diameter, and will be slowly growing over the coming days. Over the next few weeks, ISON should brighten significantly. It may reach naked-eye visibility in another week or so. In the meantime, keep your eye on the comet and realize that, even if it's subtle, you're witnessing one of nature's most amazing visitations, a rare and distant traveler wafting into the inner solar system, a stranger from the sea of darkness beyond us. 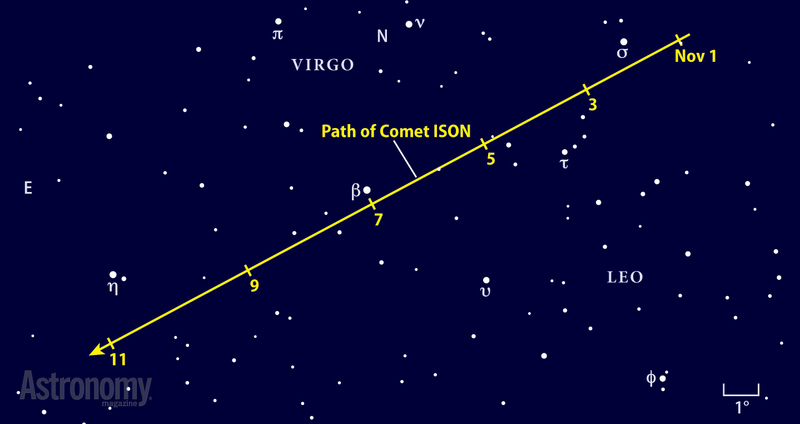 In early November, Comet ISON traverses a sparse star field in Leo and Virgo. David J. Eicher is Editor-in-Chief of Astronomy magazine, author of 17 books on science and history, and president of the Astronomy Foundation. His book COMETS! Visitors from Deep Space was just published by Cambridge University Press.